Christina Reads YA: Because You Love to Hate Me Pre-order Promo + Chat about Villains! 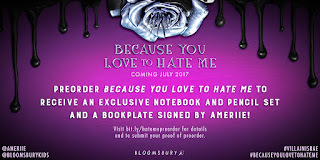 Because You Love to Hate Me Pre-order Promo + Chat about Villains! Guess what? 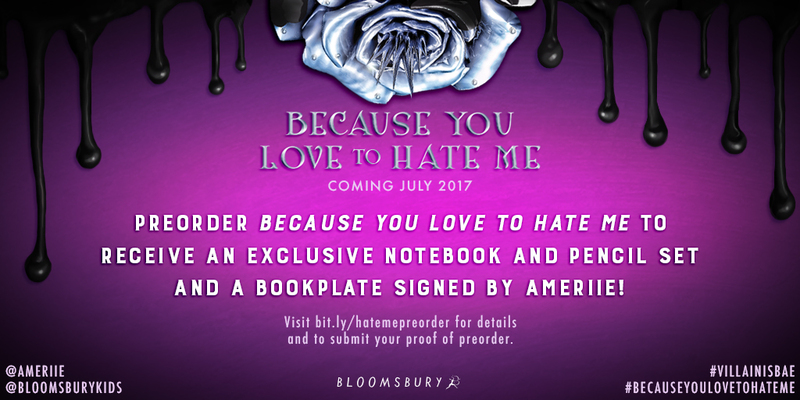 If you pre-order Because You Love to Hate Me, a YA villain-themed anthology that pairs booktubers/bloggers with authors (cc: initial announcement, cover reveal, back cover and author pairing reveal), you will get a notebook and pencil set, and a bookplate signed by Ameriie. The pre-order is open to anyone in the US, Canada, UK, Ireland, Australia, or New Zealand, and applies to both print and ebook formats. "Submit your proof of preorder here by July 10th, 2017 in the USA and Canada, July 12 in the UK and ROI, and August 31st, 2017 in Australia and New Zealand." Read the post for the full details if you're interested. Also feel free to add on Goodreads :D.
And on Mondays from June 5 - July 24, check out the Bloomsbury twitter feed, as we'll be discussing villains more generally. You'll also hear more about the anthology pretty soon from all of us! Yay, I hope you're as excited as I am!